When you look at the root causes behind injuries and ailments, issues may stem from things like physical trauma, infection, or improper equipment. Sometimes, though, it is an inherent body structure that leads to problems. A common example of this with regard to foot and ankle conditions is your arch type. 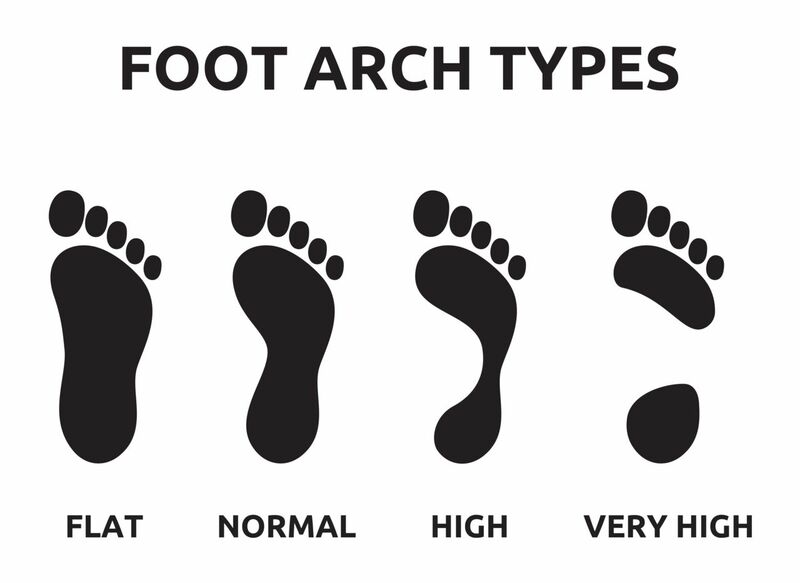 Understanding the different arch types and the role they play can help you know when to seek help and receive treatment to correct the condition. The arches in your feet are formed by bones, tendons, and ligaments and play an important role in both weight bearing and movement functions. These structures help provide both stability and flexibility in your feet. They also absorb the majority of the forces that come with the impact from striking the ground while walking, running, or jumping. There is a certain degree of natural variance when it comes to foot arches. Individuals have one of three different types: normal (medium), low (flat feet), or high. Each has its own particular intricacies and may increase the likelihood of certain ailments. Roughly 60% of the general population has arches that are medium height. This particular arch type is the most biomechanically efficient of the three, but having medium arches does not mean that you are not still susceptible to common foot problems like ball-of-foot discomfort or heel pain. Approximately 20% of individuals have flat feet. These arches tend to be flexible in nature and are often imbalanced from a biomechanical perspective. This can put your feet at greater risk for such foot problems as arch pain, plantar fasciitis, and heel pain. The other 20% of individuals in the general population have high arches. Also known as cavus foot, this particular arch style tends to be more rigid than the other ones. Instead of the foot having additional surface area to absorb the forces that come with walking or running, almost all of the stress is absorbed by the heel and ball of foot areas. Pronation is the biomechanical process whereby your feet roll inwards with every step you take. This process begins with the heel striking the ground and continues all the way through the final push from your toes. It is completely natural and helps your body to absorb the forces that come with impact, but arch type can lead to two variations of this motion – overpronation and supination. Overpronation is what we refer to an excessively inward rolling motion. Whereas it is not necessary to have low arches to overpronate, it does make it more likely. The problem with overpronation is that it causes the rest of the leg to twist in an unnatural manner, which can lead to pain in the ankles, knees, hips, and lower back. Supination is the opposite of overpronation. Instead of the foot rolling inwards too much, it doesn’t roll enough and this leads to excessive pressure on the outside edge of the foot. As a result, the smaller toes do more work than they are intended and it creates extra strain on the ankle tendons and muscles. When it comes to treating issues that stem from low or high arches, orthotic inserts are a proven, effective method of correcting the condition that causes problems. Orthotic inserts are different than the inserts found in national pharmacies and retail stores, though. Those products can offer additional support and conditioning, but are not able to treat an actual medical condition. Custom orthotics that are prepared and prescribed by our office, on the other hand, are customized for your specific feet and intended to correct biomechanical issues that arise due to your inherent arch structure. We will perform gait analysis and measure your feet to produce orthotics that work for you. If you are experiencing pain—whether due to arch issues or any other root cause—in your feet and ankles, come see the professionals at Richardson Podiatry Associates. If you live in the Plano, Dallas, or Richardson, TX communities, contact our office by calling (972) 690-5374 or using our online form to request an appointment today.